Three days ago, a No Man’s Sky community leader saw one of her bases erased by a notorious streamer who roleplays as a tyrannical overlord. In response, the community put their foot down. SeriusGamerX, or SGX, is a streamer who mainly plays No Man’s Sky. His whole gimmick is that he’s an evil overlord, playing in character as “The Gek Emporer,” whom he described over email to Kotaku as “a character that is supposed to be evil ... and [the] rightful conquerors of the No Man’s Sky universe.” It’s common for his streams to begin with orchestral music and self-aggrandizing speeches, which then segues into him chain-smoking and talking about his nefarious plans with his friends as he roams around the No Man’s Sky universe. SeriusGamerX is not the only No Man’s Sky player with a gimmick. Roleplaying is a big part of the player community, which includes player-made civilizations, governments and police forces, often populated by roleplayers acting their parts. But the people who have run into SGX aren’t all down with this character and behavior. Lillihop, the player who saw her base destroyed, is a No Man’s Sky community member who runs Cafe 42. It’s a No Man’s Sky fan space on the social networking site Amino, and it has over 400 members. “It’s the most troll-free place I’ve ever been,” she said over Twitter direct messages. “We’re neutral, and support all players—as long as they aren’t doing actual harm to others’ game play.” Lillihop is one of the few female civilization leaders, something she takes pride in. She sees herself as a kind of mediator between civilizations, so when she saw that SGX was catching the ire of other players and civilizations, she tweeted to him asking to chat. Soon afterward, she tweeted that SGX had erased one of her bases and derided her on stream for being a woman, and was also threatening to take another landmark base of hers she made as a gift to another civilization. Her base isn’t the only base that SGX has allegedly overwritten, but it was the only one that came with a side helping of sexist commentary. The former location of Lillihop’s base. Popular No Man’s Sky YouTuber CobraTV tweeted to SGX that, “roleplaying does not include being sexist and discrimination,” and 7101334, leader of the Galactic Hub, also encouraged other players to report SGX’s channel for harassment. 7101334 provided Kotaku with a tip for restoring erased bases. If you go back to a previous save where the base is visible to other players, then change a minor element like removing and then adding a chair or a flag, your base will be visible again within an hour. SGX has not denied that he threatened Lillihop’s base, nor has he recanted his statement that he “doesn’t like female leaders,” in No Man’s Sky. He just doesn’t see what the big deal is. 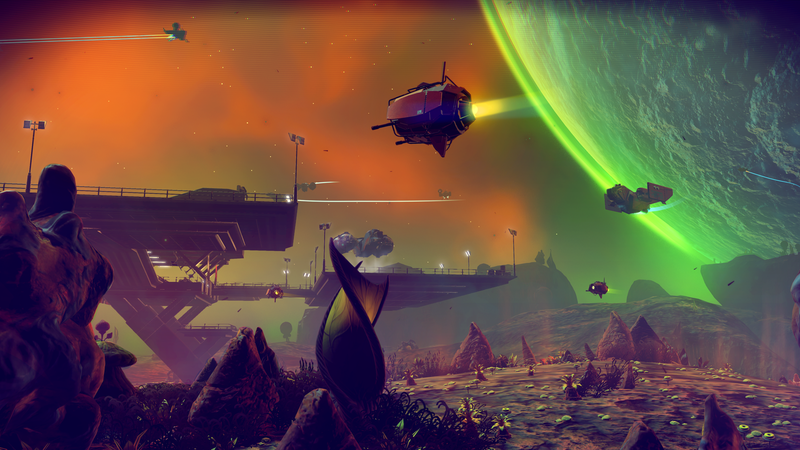 “I know some people don’t like the way I roleplay,” SGX said to Kotaku, “but do you get angry at actors on screen when they play EVIL as part of the character?” In a two hour video titled “A BIG MESSAGE TO THE NO MAN’S SKY COMMUNITY,” SGX reiterated this point numerous times: he’s just roleplaying, and the people who are criticizing him and reporting his channel are the real bullies and harassers.